I have been dropping hints for the last week or so about my new sewing machine. I hadn't wanted to talk about it until I had something other than little sewn swatches to show you. I ordered my new sewing machine at the Harrogate Show from White Rose Sewing & Craft. 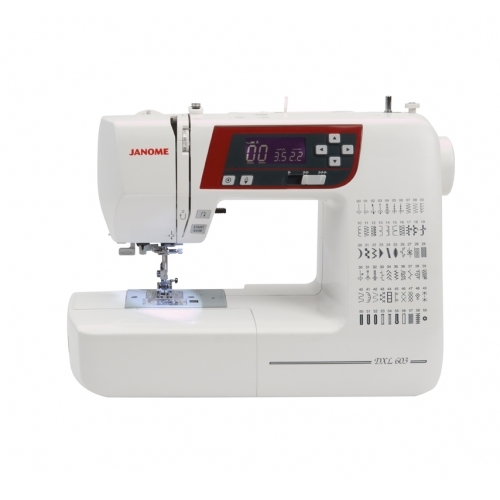 The machine I settled on is the Janome DXL603 which has been reduced in price to £369 and has a Quilting Kit worth £99 included in the package. I am really pleased with the machine I got. I'm especially pleased that I didn't have to buy all the quilting stuff, as I was going to buy all that anyway. This new machine is particularly meant to be used for making bags and quilts, both of which need a walking foot and a quilting table. I didn't really go intending to get a sewing machine with around 60 stitches on it, but I did want one with a drop in bobbin and stretch stitches. I also wanted a needle up and down button. The main criteria for me was the ability to go through great big wodges of fabric, interfacing and batting, folded over, so I could make bags without breaking my machine. This machine just sails through all of that without skipping a beat. I can also sew in my kitchen and not disturb the OH while he watches TV or listens to the radio in the other room - which is an added bonus! My first project on this sewing machine was another Amish Puzzle Ball. The original Puzzle Ball, used some fabric left over from my pyjamas. I managed to cut an extra 12 pieces of this material, by accident, so I put them to one side and knew I would end up using them in my next Puzzle Ball. To go with my left over purple fabric pieces, I bought some bright green fleece from the market - £4 a metre, you can't go wrong with market prices! I cut up the fabric and sewed the puzzle ball in a couple of hours. The fleece creates a much sturdier sphere, and it is soft and fluffy to the touch. I really prefer the structure on this Puzzle Ball, and know that next time I make one of these great toys I will use fleece on at least part of each segment. I think the two fabrics work well together and the sewing machine worked like a dream. I see a lot more sewing in my future, which means you will be be seeing a lot more too!